Hello ... Hello ... my old friends ... It's great to see you once again! 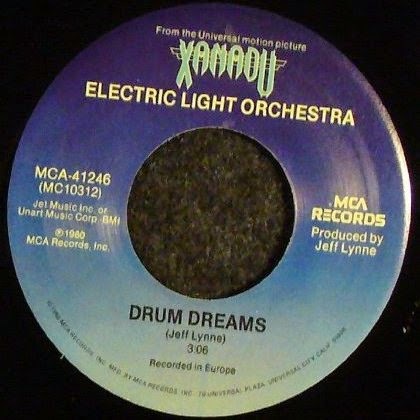 Until today, and quite by accident, it didn't occur to Yours Truly KJS that ELO's perennial "Xanadu" 'B' side jewel "Drum Dreams" had an interesting double life when the "Xanadu" OST was released via MCA Records in the United States during 1980 [Jet Records were the exclusive licensees for the UK/Europe]. Second Time Around: "Drum Dreams" was a US 'B' side ... twice! Most ELO fans are doubtless aware than "Drum Dreams" was the acknowledged flip side for lead single "I'm Alive" on both side of the Atlantic [UK: JET179; US: MCA-41246]. But I completely missed [until today] that "Drum Dreams" was also the 'B' side for the American release of "All Over The World" [#MCA-41289] whereas "Midnight Blue" graced the UK release [JET195]. 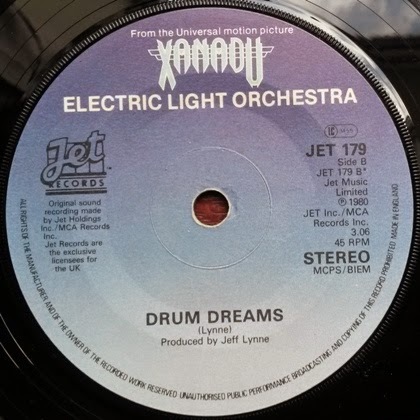 "Drum Dreams" is - of course - also one of the few remaining Jeff Lynne penned original ELO tracks which has yet to find its way onto any CD release alongside, of course, the legendary "Beatles Forever". ELO Beatles Forever [ELOBF] cannot think of any other occasion where an ELO 'B' side was repeated other than [a] "Across The Border" being found on both the withdrawn second ELO EP [ELO2] and the reverse of "Don't Walk Away" [JET7004] and [b] the two versions of "Matter Of Fact" on Side 2 the UK 12" single of "So Serious" [TA7090]. Such are the wonders of being a fan, follower and collector of the audio and visual releases of the Electric Light Orchestra and related artistes!